The New York Times, September 4, 1910. Click image for pdf. 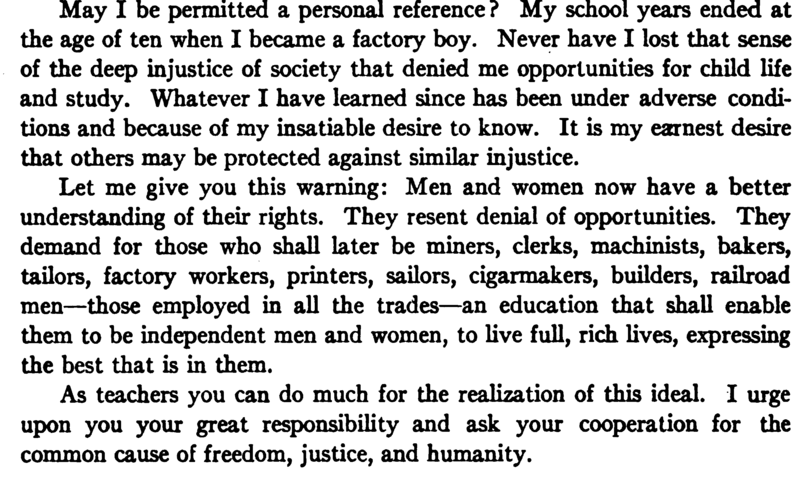 Excerpts from a speech given to the 1916 Convention of the National Education Association, “The Public Schools and the Working Man,” (full speech linked). 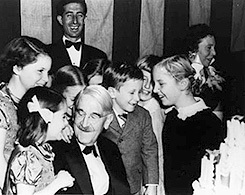 Gompers was followed by John Dewey on the program! For those in Madison, please join the celebration of Labor Day at LaborFest, September 3, 12:00 Noon to 5:30, at the Labor Temple, 1602 S. Park St (poster/flier linked here). Good music, good food, good people, good idea. Labor Day Mega Music Post. Margaret Haley: A Heroine of Education, Labor, Feminism and Politics. This is the third in a new series on AMPS: Blasts from the Past. The series is devoted to historical materials that comment on or illuminate contemporary issues in education. “JUST ABOUT TIME HE TOOK A WALK!.,” original caption, The American School Board Journal, July 1921. This is the first in a new series on AMPS: Blasts from the Past. 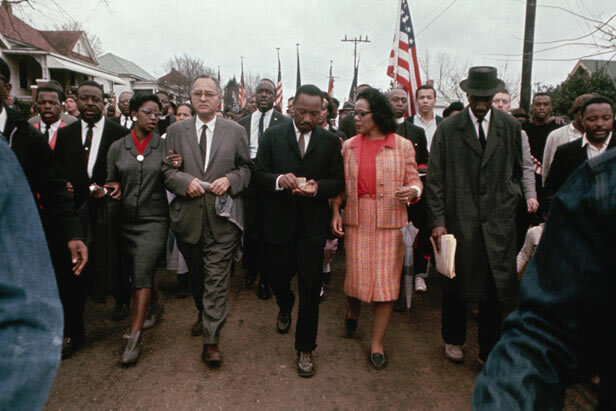 It will be devoted to historical materials that comment on or illuminate contemporary issues in education. I’ll usually also post some links to recent, related things and often a song too. I’m a historian by training, so I feel compelled to say that historical analogs should always be carefully examined, developments in the past are never identical to developments in the present. Both continuity and change should be assessed. In this series the emphasis will be on continuity, but I realize that’s only part of the picture. The inspiration for this series came earlier this week when I stumbled upon full volumes of the American School Board Journal in Google Books. For my dissertation research I went page-by-page through over 30 years of that journal, I know these will provide much material for this series, but I’ll also be looking for other sources. Some links on educational profiteers in 2012 (so many possible that I am just posting a handful of links). Jersey Jazzman, “What Education “Reform” Is Really About: $$$” (be sure to watch the video). For background on Entertainment Properties profiteering see: Ken M. Libby, “Entertainment Properties Trust and Imagine Schools: the St. Louis Situation.” Imagine has pursued similar practices in Ohio (see: “Public Good vs. Private Profit: Imagine Schools, Inc. in Ohio”), Indiana (see Karen Francisco. “Charter schools and vultures”), Florida (Florida Imagine Charter Schools pay huge leases to a company owned by…Imagine Charter Schools.) Nevada and elsewhere (for an overview from the New York Times, “For School Company, Issues of Money and Control.” There is a local Madison angle to all of this too; it was Joe Robert, Kaleem Caire’s former employer and mentor, who initially set up these arrangements. Noah Davis, “Rupert Murdoch Will Now Take Over The World Of For-Profit Education.” See also Joel Klein’s (Murdoch’s education front man) recent self-serving defense of the profiteers. Just the tip of the iceberg. Well past time for them to take a walk. 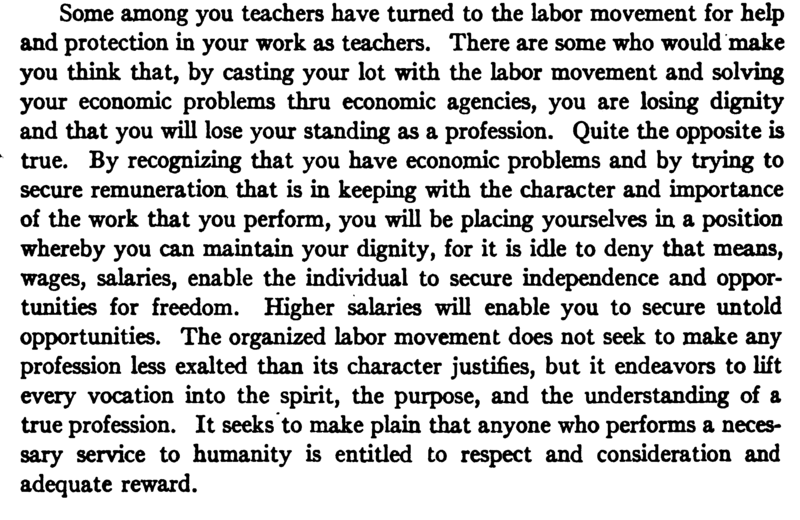 The Labor Day extravaganza starts with a lengthy excerpt from the1886 Platform of the Knights of Labor. It is a good reminder that the sruggle has been going on for a long time. 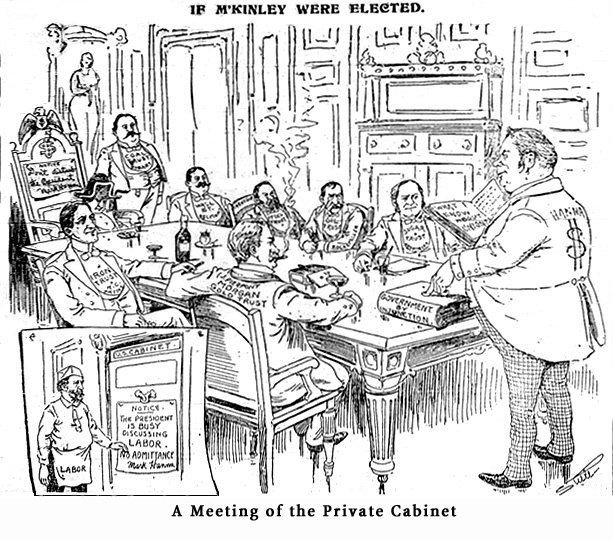 Therefore we have formed the Order of the Knights of Labor, for the purpose of organizing and directing the power of the industrial masses, not as a political party, for it is more — in it are crystalized sentiments and measures for the benefit of the whole people, but it should be borne in mind, when exercising the right of suffrage, that most of the objects herein set forth can only be obtained through legislation, and that it is the duty of all to assist in nominating and supporting with their votes only such candidates as will pledge their support to these measures, regardless of party. But no one shall, however, be compelled to vote with the majority, and calling upon all who believe in securing the greatest good to the greatest number, to join and assist us. 1. To make industrial and moral worth, not wealth, the true standard of individual and national greatness. 2. 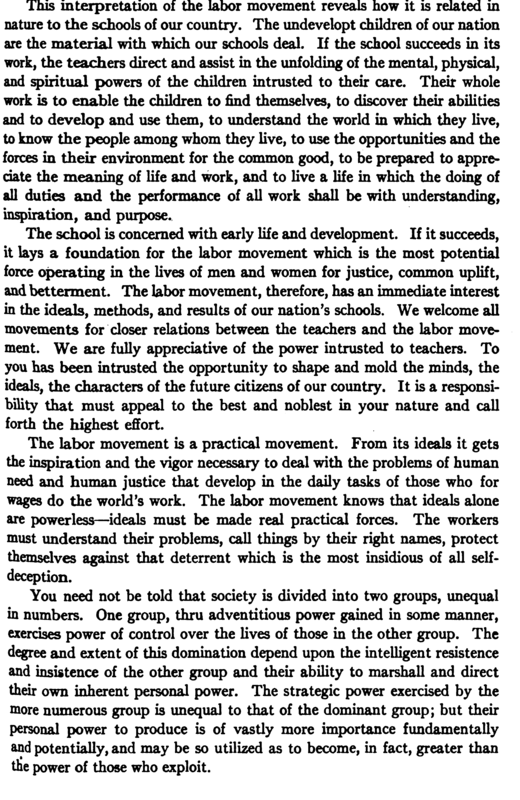 To secure to the worker the full enjoyment of the wealth they create, sufficient leisure in which to develop their intellectual, moral and social faculties; all of the benefits, recreation and pleasures of association; in a word, to enable them to share in the gains and honors of advancing civilization. Next up is a reminder to attend the South Central Federation of Labor LaborFest, at the Labor Temple (Park and Wingra). Lots of good people, activities for all ages, good food and drink and music from Mel Ford and Paul Cebar and the Milwaukeeans. You can download a flier here. While on the topic of reminders, the pending bill requiring that labor history be taught in Wisconsin schools could use your support. Find out more here and also check out the other great things that the Wisconsin Labor History Society has to offer. Last, that labor classic “I’m Sticking with the Union” as performed by a stellar cast at Pete Seeger’s 90th Birthday concert. 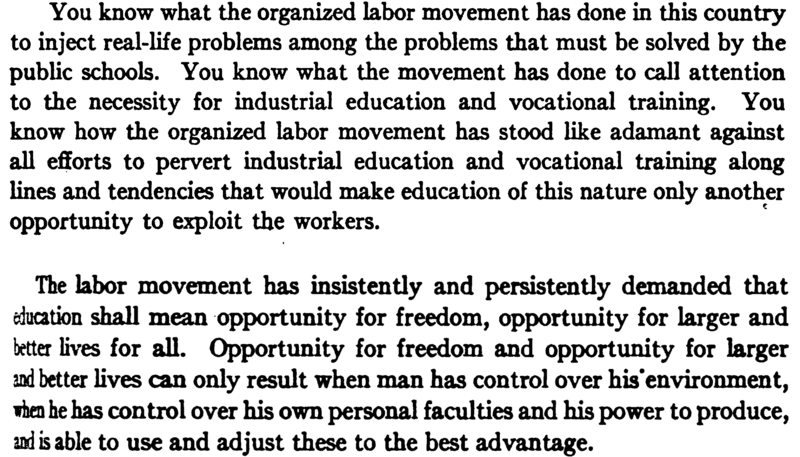 Last year’s Labor Day post, with more music and history can be found here. 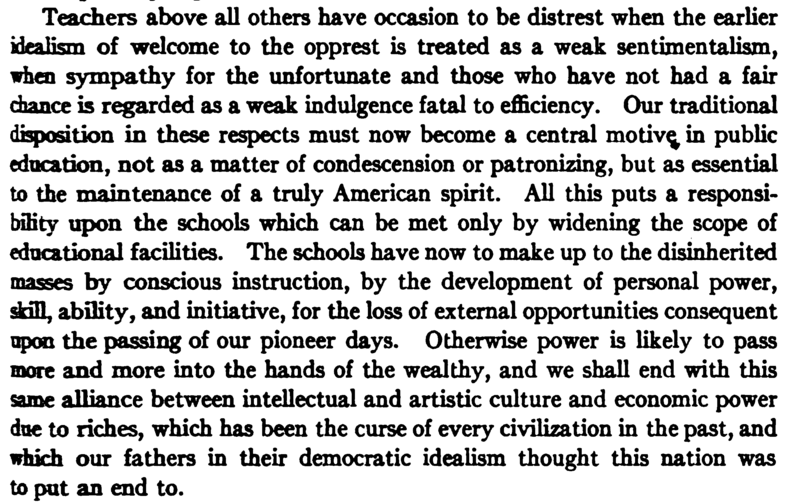 Franklin Delano Roosevelt’s June 1938 speech to the National Education Association (hat tip, Crooks and Liars). We have believed wholeheartedly in investing the money of all the people on the education of the people. That conviction, backed up by taxes and dollars, is no accident, for it is the logical application of our faith in democracy. Here is where the whole problem of education ties in definitely with natural resources and the economic picture of the individual community or state. We all know that the best schools are, in most cases, located in those communities which can afford to spend the most money on them—the most money for adequate teachers’ salaries, for modern buildings and for modern equipment of all kinds. We know that the weakest educational link in the system lies in those communities which have the lowest taxable values, therefore, the smallest per capita tax receipts and, therefore, the lowest teachers’ salaries and most inadequate buildings and equipment. We do not blame these latter communities. They want better educational facilities, but simply have not enough money to pay the cost. 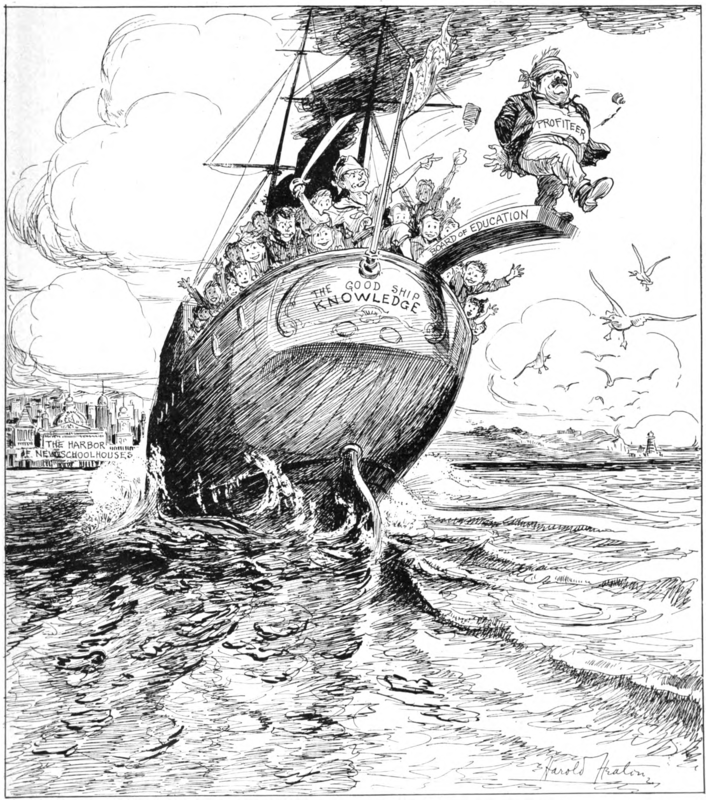 There is probably a wider divergence today in the standard of education between the richest communities and the poorest communities than there was one hundred years ago; and it is, therefore, our immediate task to seek to close that gap—not in any way by decreasing the facilities of the richer communities but by extending aid to those less fortunate. We all know that if we do not close this gap it will continue to widen, for the best brains in the poor communities will either have no chance to develop or will migrate to those places where their ability will stand a better chance. Make them listen to this in Madison and in Washington.